LG's top model in the Q7 line promises users upper mid-range performance, and the new device offers the QLens AI technology otherwise found in LG's premium smartphones. But what will buyers of the LG Q7 Plus really get for their 400 Euros (~$470)? Read our review to find out. The LG Q7+ is a smartphone considered to be a mid-range device in the LG Q series. Despite being placed in the mid-range segment, the Q7+ is powered by the Snapdragon 450 SoC - a budget SoC that powers devices such as the Xiaomi Redmi 5. Despite this, the performance is rather smooth for light usage. The LG Q7+ is designed to provide premium comfort. The real metal frame complemented by gently curved 2.5D arc glass is as nice to look at as it is to hold. The phone is available in Aurora Black and Moroccan Blue color options. At just 143.8 x 69.3 x 8.4 mm, it is also quite handy in terms of form factor; it is smaller than the G6 and G7+ ThinQ, but just a wee bit thicker than these flagships. It is also fairly light at just 145 grams. The Q7+ features a rear fingerprint sensor for unlocking the device seamlessly and now has added functionality, such as doubling up as a camera shutter or a screenshot button based on the app you are using. Users can even scroll down on it to bring down the notifications bar and check all active notifications. The phone is IP68 certified for water and dust resistance and has a military grade MIL-STD 810G certification. This makes the Q7+ shockproof, waterproof and dustproof to meet the IP68 rating. It features an 8MP front camera with Portrait mode for bokeh effect, both in real-time or after shooting the scene, as well as a 16MP rear camera with PDAF, short for phase detection AF. It is supposedly 23% faster than traditional AF according to LG. It features portrait mode, which allows users to take shots with the subject in sharp focus, standing out against an artfully blurred background. Furthermore, the camera features a mode call QLens, which was first introduced with the LG V30S ThinQ. It scans anything onscreen and surfaces links to buy it online at Amazon. Pinterest integration also surfaces matching images in case users were looking for them. 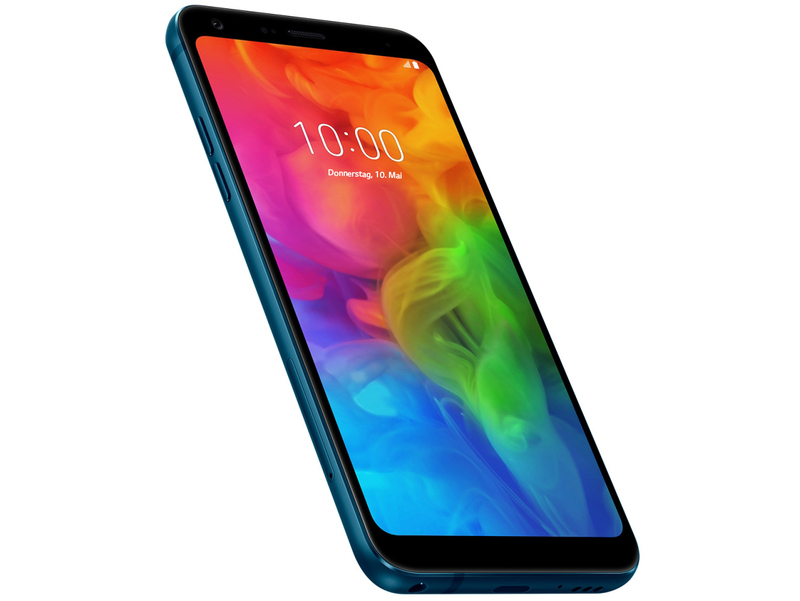 As for the display, it features a 5.5-inch Full-HD+ FullVision display with a resolution of 2160 x 1080 pixels and an aspect ratio of 18:9. It can maximize the user’s view and enjoyment on a display that delivers clearer picture quality, and a more vivid visual experience. In terms of the operating system, the device runs on Android 8.0 Oreo. Users can also enjoy 3D audio with DTS:X surround sound technology that can mimic 7.1-channel audio on a headset. Apart from the flagship LG G7+ ThinQ, no other phone in the market has this feature. For charging, it features fast charging, which means one can charge the device faster than with conventional chargers thanks to the easy-to-connect and reversible Type-C connector. ARM Mali-T860 MP2: Dual-Core version of the Mali-T860 graphics card from ARM for mostly Android based smartphones and tablets. E.g. in the Mediatek Helio P10 clocked at 700 MHz and produced in 28nm. Only some 3D games with very low demands are playable with these cards. » Further information can be found in our Comparison of Mobile Graphics Cards and the corresponding Benchmark List. MT6750S: ARM-based octa-core SoC (4x Cortex-A53 up to 1.5 GHz + 4x Cortex-A53 up to 1 GHz) with 64-Bit support and integrated LTE Cat. 6 radio. Compared to the MT6750, the MT6750S seems to offer a higher clocked graphics card.» Further information can be found in our Comparison of Mobile Processsors. LG Electronics Inc. is a subsidiary of the LG Group. LG is the world's second-biggest maker of televisions and third-biggest maker of mobile phones. With its headquarters in South Korea, the company has 75 subsidiaries worldwide that design and manufacture televisions, home appliances, and telecommunications devices. LG is an international laptop manufacturer of medium size with few reviews. After a few years, LG largely withdrew from the laptop sector. In the smartphone segment, LG is a medium-sized manufacturer (not among the Top 5 in 2015 and 2016). 77.13%: This rating is not convincing. The laptop is evaluated below average, this is not really a recommendation for purchase.